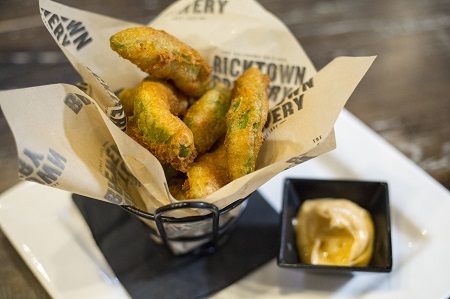 Beer-battered avocado slices. Served with Habanero mango aioli for dipping. 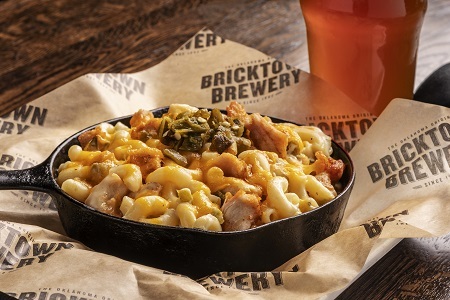 Pulled chicken & hatch green chile relish atop macaroni with Queso blanco sauce. 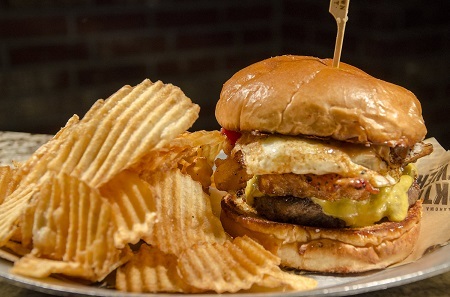 Fried egg, hash browns, american cheese, sweet peppered bacon, burger sauce. Macaroni & cheese, shaved ham, american cheese and pecorino romano cheese between grilled bread. 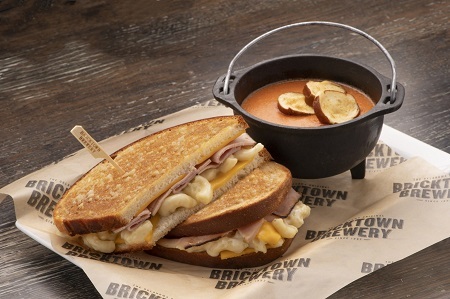 Served with san marzano tomato soup topped with pretzel croutons. Beer-battered Watonga cheddar curds. Served with ranch dressing. Two 1/4 pound black angus burger patties, two slices of american cheese, tomato, pickles, leaf lettuce, burger sauce on a martin potato bun. Sausage, canadian bacon, ground beef, pepperoni, sweet peppered bacon, Red sauce, mozzarella. Sliced tri-tip steak and white cheddar on grilled sourdough bread with rosemary au jus. Served with fries. Fried chickpeas, feta, avocado, cucumber, red pepper, red onion and fresh greens tossed in balsamic vinagrette. 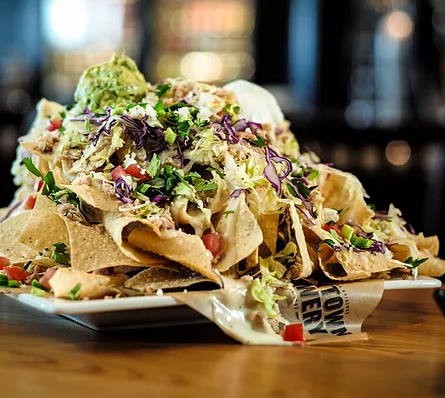 Chips, white queso, jalapeños, onions, tomatoes, red cabbage, guacamole, cilantro, lettuce, Queso fresco, sour cream. Bavarian soft pretzels, white queso. Fried shrimp, boom boom sauce, fries. Chips, slow-smoked pork shoulder, bbq sauce, cheese blend, white queso, cholula® sour cream, cilantro. 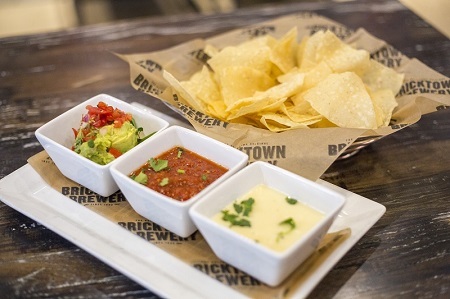 White queso, fresh guacamole, housemade salsa, bottomless tortilla chips. Boneless or buffalo wings served with bleu cheese, celery and carrots. Choice of sauce: sissy, anchor bar or “@$!#&”. Sweet potato fries, chopped sweet peppered bacon, sweet and spicy caramel sauce, sea salt. Served with your choice of side. Gluten-free bun available. A 1/4 pound black angus burger patty, american cheese, tomato, pickles, leaf lettuce, burger sauce on a martin potato bun. 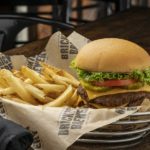 We serve black angus beef. Served with your choice of side. Gluten-free bun available. Sweet peppered bacon, cheddar, burger sauce. Spicy black bean patty, grilled portobello mushroom, burger sauce. Ground turkey patty, burger sauce. White queso, hatch green chile relish, arugula, tomato, tortilla strips. Four slices of american cheese, burger sauce, lettuce, tomato, red onion, pickles. Sweet peppered bacon, frizzled onions, buffalo bleu cheese sauce, lettuce, tomatoes, pickles. Ground bison, whiskey caramelized onion glaze, arugula, tomato, pickles. Served with your choice of side. Gluten-free bun available. * Consuming raw or under-cooked meat, poultry, seafood, shellfish or eggs may increase your risk of foodborne illness especially if you have certain medical conditions. All-natural chicken, sweet peppered bacon, charred onions, pepper jack, lettuce, tomato, dijon sauce. Served on a pretzel bun. Grilled chicken, white queso, hatch green chile relish, tomato, arugula, tortilla strips. 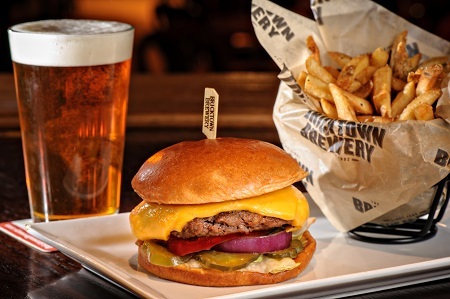 Served on a brioche bun. 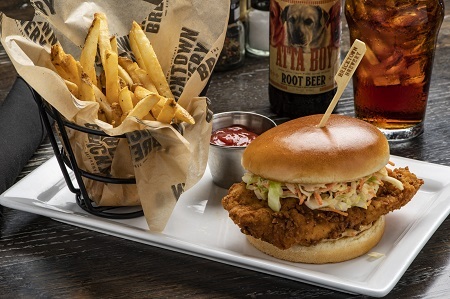 Fried chicken, spicy mayo, slaw. Served on a brioche bun. 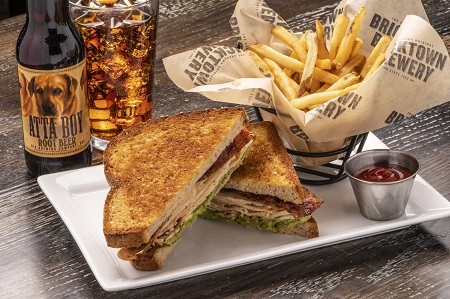 Roasted turkey, sweet peppered bacon, swiss, bacon aioli, guacamole. Served on 9-grain bread. Turkey, ham, bacon, cheddar, pepper jack, lettuce, tomato, chipotle aioli. Served on focaccia bread. Meatloaf, chili sauce, melted cheddar, frizzled onions, grilled tomatoes. Served on brioche. Shredded pork, sweet peppered bacon, charred onions, bbq sauce. 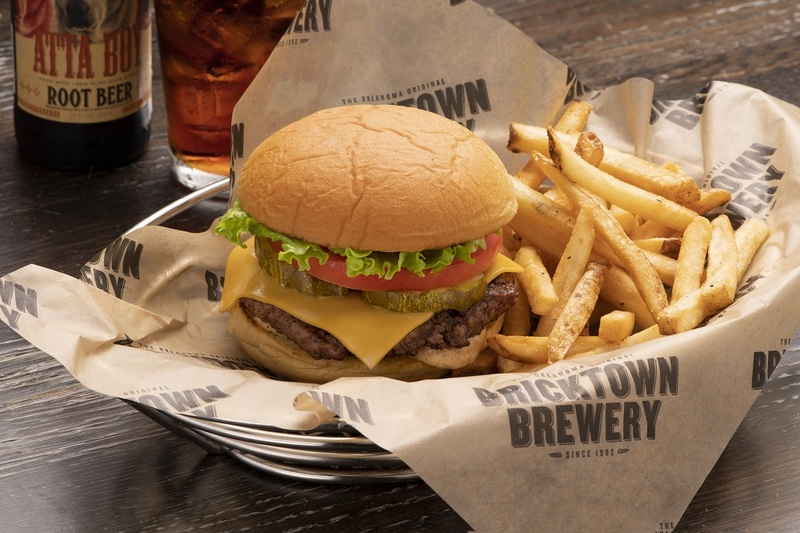 Served on a pretzel bun with a side of bread & butter pickle slaw. Onions, red peppers, green olives, black olives, mushrooms, tomatoes, pepperoncinis, red sauce, mozzarella. San marzano red sauce, mozzarella. Fresh Mozzarella, roasted Roma tomatoes, goat cheese and arugula. 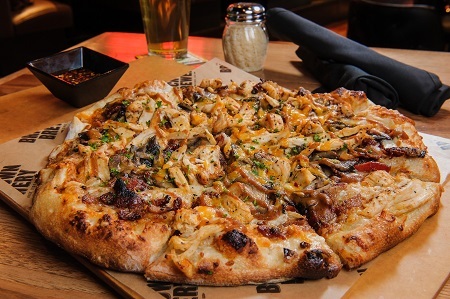 Pulled roasted chicken, onions, cilantro, diced jalapeños, cheddar, sweet peppered bacon, BBQ sauce, mozzarella. Spinach, shredded parmesan, artichoke hearts, garlic, oil, mozzarella. Pineapple, canadian bacon, red sauce, mozzarella. Sausage, mushrooms, red sauce, mozzarella. Sausage, ground beef, pepperoni, ham, mushrooms, red peppers, onions, red sauce, mozzarella. 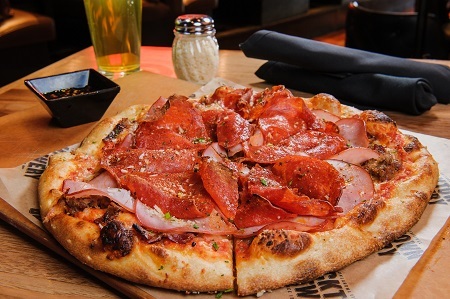 Crisp greens, pepperoni and ham slices, red pepper, sliced pepperoncini, artichoke hearts, roma tomatoes, mozzarella cheese, black olives and pecorino romano. Tossed in brown derby vinaigrette. 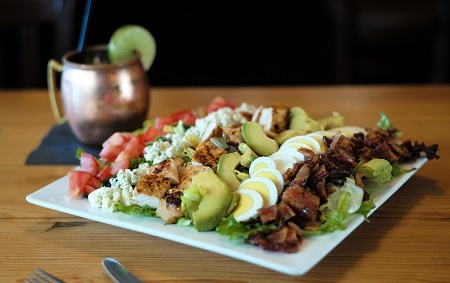 Grilled chicken, avocado, egg, bleu cheese crumbles, tomatoes, sweet peppered bacon. Tossed in brown derby vinaigrette. Fresh greens, cheddar, red onions, carrots, tomatoes, bacon, cucumber, croutons, choice of dressing. Iceberg wedge, housemade bleu cheese dressing, tomatoes, bleu cheese crumbles, bacon. Rich, creamy tomato soup made with san marzano tomatoes. Topped with pretzel croutons. Red chili with ground beef, beans, millie’s red rye ale, onions, and seasonings. Topped with cheddar and sour cream. French onion soup, brioche crouton, swiss, shredded asiago. Fried chicken, fresh greens, broccoli, sweet peppered bacon, red pepper, carrots, sunflower kernels, raisins, shredded Parmesan, red delicious apple. Tossed in parmesan garlic dressing. Housemade, topped with tortilla strips. 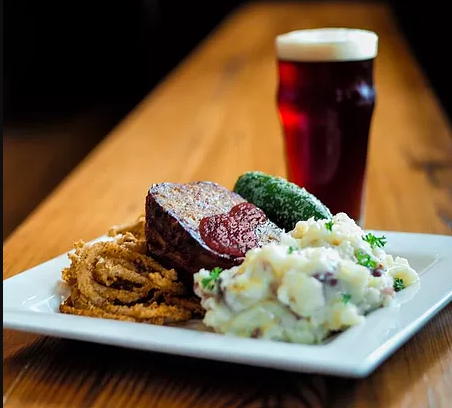 Two slices of grilled meatloaf made with black angus beef and fresh ground pork, wrapped with bacon, glazed with chili sauce. Frizzled onion strings, mashed potatoes, green beans. Hand-battered all-natural chicken breast, maple pepper gravy, mashed potatoes, green beans. Hand-battered chopped steak, maple pepper gravy, mashed potatoes, green beans. 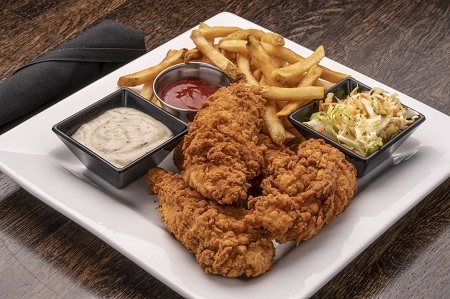 Hand-battered jumbo all-natural chicken, choice of maple pepper gravy or homemade bbq sauce, fries, bread & butter pickle coleslaw. 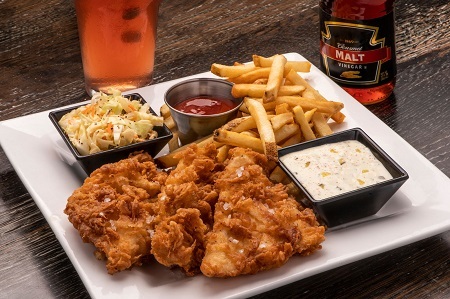 Beer-battered cod and fries or choice of side. Served with bread & butter pickle slaw. Turkey breast, potatoes, carrots, peas, pearl onions, thyme béchamel sauce, golden brown puff pastry. Poached salmon fillet served with blueberry salsa and steamed broccoli. 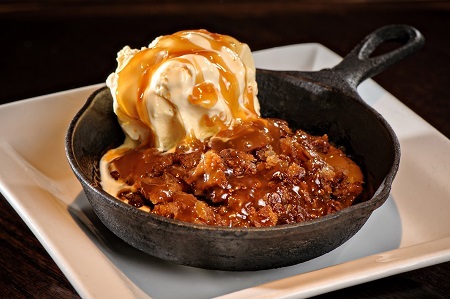 Southern-style apple crisp in a sizzling skillet, vanilla ice cream, caramel sauce. Served warm with vanilla ice cream and raspberry sauce. Bricktown-brewed atta boy root beer poured over two scoops of ice cream. 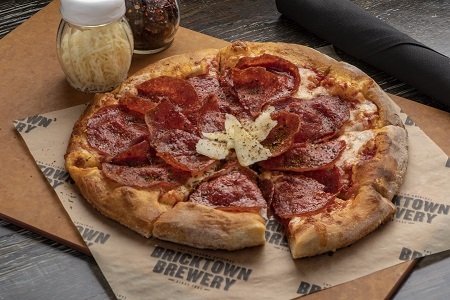 Get Bricktown Brewery delivered hot & fresh in Springfield, MO! We use high-quality delivery bags and 140-degree warmers to ensure only the hottest and freshest food is delivered. Place your order online through Lightning Delivery. We accept cash and card in person, were locally owned and operated since 2010.